North Eastern Hill University (NEHU) is recruiting for the post of Junior Engineer for the year of 2015, location at Shillong. 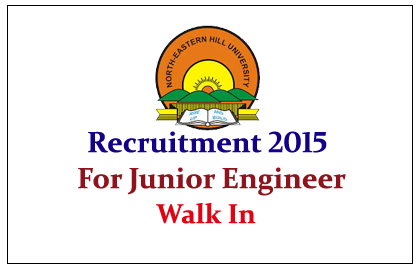 Eligible candidate can apply here on or before 15th June 2015. North Eastern Hill University is a Central University established on 19 July 1973 by an Act of the Indian Parliament. The university is in the suburb of Shillong, the state capital of Meghalaya, India. Eligible Candidates can attend the walk in Interview on 15.06.2015. application may be submit on the day of Interview, For more details kindly check Official Notification.